The Hatchery opened in East Garfield Park in 2018. The food and beverage business incubator, a 67,000-square-foot food facility, will spur economic activity in one of Chicago’s highest-need neighborhoods by creating over 900 new jobs by 2023 and providing access to fresh food to a city-designated food desert. 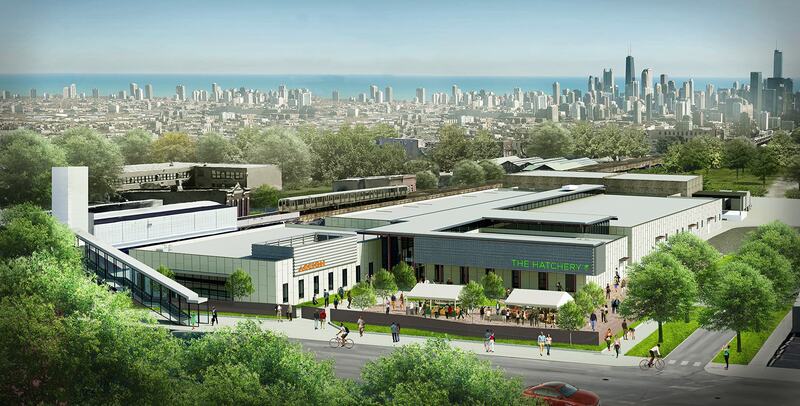 The Pritzker Traubert Foundation provided funding to support the development of a Training Center at The Hatchery, designed to provide job training to 18 to 24-year-olds in East Garfield Park and access to jobs in the $32 billion food and beverage industry. The Obama Presidential Center chose Chicago’s historic Jackson Park as its location after a national competition. In addition to empowering and connecting people from around the country and the world, the Obama Presidential Center will also be a boon to the local economy. During its construction and first ten years of operations, the Center is estimated to create thousands of new jobs and infuse $3.1 billion into the local Chicago economy. The Pritzker Traubert Foundation’s capital grant to the Obama Foundation will support the building of the Center. In addition, the Foundation is supporting a newly forming Obama Youth Jobs Corps, which aims to help youth on the southside of Chicago obtain internships and jobs connected to the Center. WBEZ ranks as one of the top 10 public radio stations nationally and serves as Chicago’s National Public Radio (NPR) station. WBEZ reaches more than 550,000 weekly listeners through broadcast, 100,000 listeners on digital platforms and has an individual membership base of 86,000 supporters. The Pritzker Traubert Foundation is providing support for WBEZ to launch an enterprise journalism desk to report on how race, class, and communities will shape the region’s future. LISC equips struggling communities with the capital, strategy and know-how to become places where people can thrive. LISC currently operates in nearly half of the city’s communities with more than 70 organizations. The Pritzker Traubert Foundation is partnering with LISC to develop an investment framework and land-use plan in collaboration with neighborhood residents and leaders for a sub-section of Washington Park bounded by Garfield Boulevard, the Dan Ryan expressway, the CTA Green Line, and 47th Street. The plan aims to deepen the impact of the new XS Tennis Village facility and other catalytic projects in the community. XS Tennis and Education Foundation (XSTEF) combines health, fitness, athletic and academic enrichment in a positive, safe-haven environment for children. XSTEF recently opened the XS Tennis Village, a 112,000-square-foot athletic and academic enrichment center in Washington Park. This new facility is located near areas in urgent need of safe, positive programs through which community members can receive enrichment and tennis training. The Pritzker Traubert Foundation supported initial planning for this beautiful new facility that officially opened in 2018.